One of the best things about working with interactive stories is they're new: the ground is mostly untested, the formulas are still in their infancy, and people are having new ideas about what works all the time. One of the hardest things about working with interactive stories is also that they're new: it's not always clear to see what to try next. It's not even clear to see how to get started. The ability to experiment is key, and we need to get more people trying things out and exploring the possibilities of interactive stories. And while we're not a self-publishing platform - we want every inklebook we produce to be something really special! - we also know that great talent isn't easy to find, especially when our best authors might not even know about interactive stories... yet! 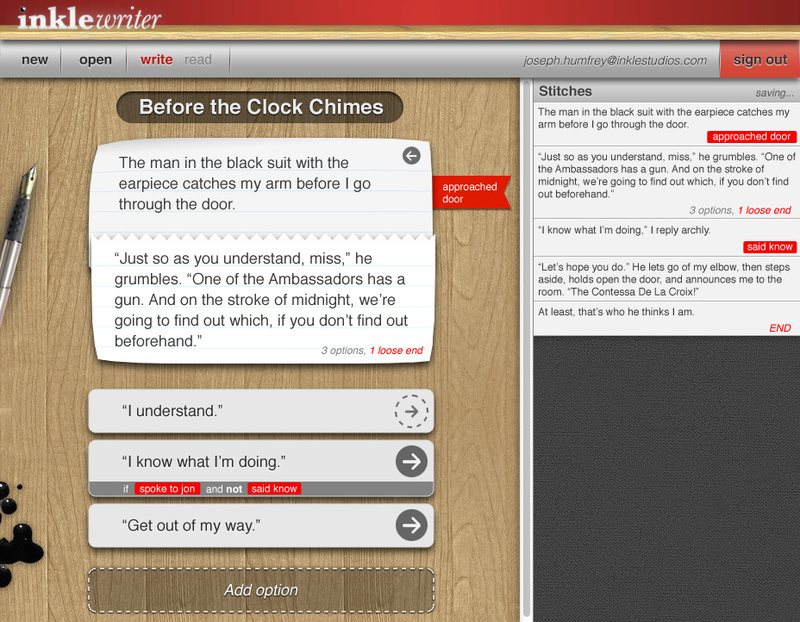 So, to writers get started, we've put together a web-tool for writing and reading simple interactive stories. Called the inklewriter, it lets you write as you play, branching the story with choices, and then linking those stories back together again. It keeps track of which paths you've finished, and which still need to be written. You'll even be able to track the choices your reader makes, and adapt the story around those decisions. Everything the reader does will have the potential, down the line, to cause catastrophe or save the day. The power's all there: it's up to you, the author, to decide how things will play out. 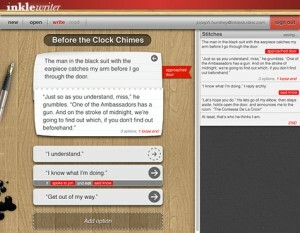 The inklewriter requires no set-up, no programming, and no drawing diagrams. Just start writing and see where it takes you. Oh, and it's free to use. And once written, you can share your stories with whoever you like. To get a sneak preview, check out our page for writers.